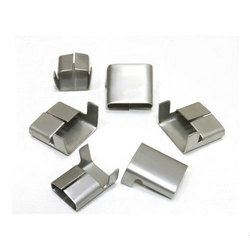 wing seals are manufactured from Stainless Steel Type SS304, SS304L, SS316 & SS316L in 0.5mm, 0.6mm, 0.8mm, 1mm, and 1.2mm thickness, suitable with Bands 13mm, 15mm, 20mm, 25mm, 40mm and 50mm width, other sizes are also available on request. Wing Seal is designed to suit the banding, easy to close in any position. Closed Type Seals are also available for special applications. Size 13mm, 15mm, 20mm, 25mm, 40mm and 50mm width, other sizes are also available on request. Usage/Application Wing Seal is designed to suit the banding, easy to close in any position. Packaging Type packed in cardboard boxes and plastic bags, shrink wrapped in pallets or crates for ocean shipping. Seals are manufactured from Stainless Steel Type SS304, SS304L, SS316 & SS316L in 0.5mm, 0.6mm, 0.8mm, 1mm, and 1.2mm thickness, suitable with Bands 13mm, 15mm, 20mm, 25mm, 40mm and 50mm width, other sizes are also available on request. The Seals are typically packed in cardboard boxes and plastic bags, shrink wrapped in pallets or crates for ocean shipping. Stainless Steel closed seals standard Spec.